An example of a redesigned Globe and Mail front page. To provide feedback on our redesigned newspaper, please email feedback@globeandmail.com. At every stage of the redesign, we asked ourselves, "how can we best serve our print newspaper readers in a digital age?" A new national Real Estate section every Friday reflects our readers' strong interest in real estate news and offers coverage of key markets across Canada. A new Opinion section every Saturday will provide our readers with a greater diversity of voices, challenging perspectives and more point-of-view journalism, along with their favourite columnists. A new Pursuits section every Saturday, containing Books, Travel, Style, Food, Wine, and Puzzles will help readers make the most of their leisure time with inspirational, aspirational and entertaining lifestyle news. A standalone Saturday Arts section: Look for broadened coverage of performance art, TV and music, as well as a deeper look at the news and institutions driving arts and culture in Canada. A standalone Saturday Sports section: Discover the people and institutions who make sport happen, as we take you beyond the field of play with eye-popping photography, sharp commentary and long-form storytelling. A standalone Report on Business Section: Get a deeper perspective on the business week in Section B and discover new weekend features, long-form stories and opinion and analysis. A robust, standalone News Section: Get news from Canada and beyond in Section A, plus find dedicated pages for regional news in British Columbia, Alberta, Toronto and Quebec. We know adjusting to these changes may take a bit of time. If you need help, please call our customer support team at 1-855-813-6111 or visit support.globeandmail.com. If you want to learn more about the design process, please visit globe-ux.format.com. Go here to read a note on the redesign from Editor-in-Chief David Walmsley. The world is changing. So is The Globe. 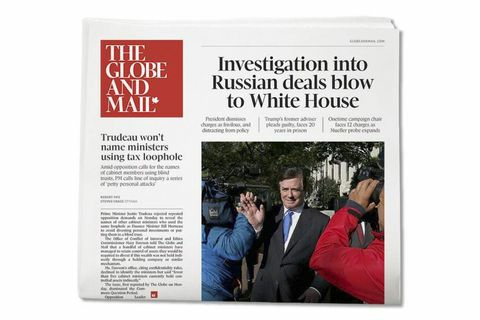 Editor-in-Chief David Walmsley shares future plans for The Globe and Mail.